of O’Leary Walker Wines in the shop for a tasting. David will be tasting some of the great wines that are in their range included some of their awesome Rieslings, Sauvignons and their classic Shiraz and the more gentle ‘Wyebo’ Shiraz which comes from a vineyard purchased by David’s grandfather in 1912. All are welcome to pop in between 5pm and 8pm for some tasters. For any further information contact Tadhg on 091-533706 or at tadhg@woodberrys.ie. 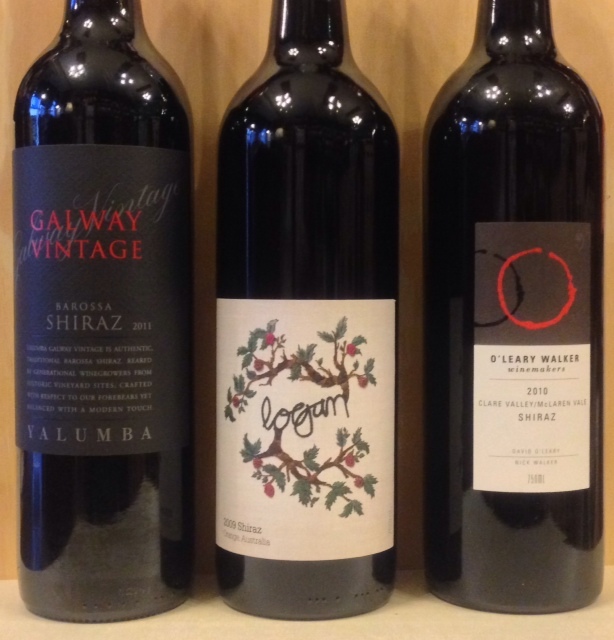 If there is one red variety Australia does, it’s Shiraz, but to often all Aussie Shiraz is tar with the same brush – big alcoholic fruit bombs. Part of the reason we love Shiraz comes down to its vibrant fruity notes dark and red berries and plummy notes, it is general voluptuous and smooth with the wines on the cheaper end offering much more sweet fruit notes. But is simply note a one size fits all variety. The variety produces various different styles depending on the region it is grown in the most famous two being Barossa and McLaren Vale. But it also inspires in wines from many other regions where the climates vary extraordinarily and hence the styles do as well – think cool climate like NSW’s Orange and SA’s Adelaide Hills. Barossa is big and bold flavours and body. McLaren Vale tends to a bit lighter with earthy and mocha notes. Clare Valley tends to berry flavours with hints of Mint and Eucalyptus and again a medium to full style. Orange is a beacon for producing cool climate wines of finesse and elegance in an old world style. Rich plum, and dark berries with pepper notes. Adelaide hills another cool climate district that produces refined Shiraz with red berry flavours and cracked pepper notes. But these are so general to be easily ignored, as the individual wine makers look to craft unique interpretation of their own. A blend of 70% Clare Valley Fruit with 30 % McLaren Vale. Showing blueberries and blackberries of Clare with a little under one-third McLaren Vale Shiraz to rev it up. Mocha, dark fruits and oak on a firm palate, fine tannin profile promises this wine will age gracefully. Hailing from the cool Orange region. The Logan 2009 Shiraz is a deep but bright red colour. The intensely perfumed aroma has mixed berries, white pepper, dried woody herbs and Chinese 5 spice characters. The medium bodied palate has flavours of red berries, plums and tarragon before a long spicy finish. This Shiraz shows all the hallmarks of a traditional Barossa Red. It has a bright colour with crimson hues. There are aromas of mulberries, ground spice and liquorice all sorts that speak of its varietal and regional origins. The palate is ripe and generous with flavours of mulberries, dark chocolate and hints of beetroot. It finishes with cocoa powder like tannins that give evenness and generosity to the wine. Historic Sevenhill Cellars is the oldest winery in South Australia’s Clare Valley. Sevenhill was established in 1851 when Jesuit priests who settled in the area planted vines to produce sacramental wine. The old stone winery and cellar door at Sevenhill is the only remaining Jesuit owned winery in Australia. The Jesuits and lay staff share a common ethos of building the Jesuit Mission to support works of charity and compassion throughout Australia. While the spiritual tradition continues (as does the production of alter wine), today Sevenhill is recognized for premium wines and fortified wines. Signature Clare valley styles are made from Riesling and Shiraz. Sevenhill is committed to creating distinctive wines that reflect the local terroir. Integral to this philosophy are modern winemaking techniques and highly prized, estate grown fruit from some of the Valley’s oldest vines. The benefits of owning and managing the vineyards from which all wines are made cannot be underestimated.